The Enterprise finds a single Borg (Jonathan Del Arco) at a crash site, and Crusher insists on nursing it back to health. The crew is cautious, given their last encounters with the Borg, and comes up with a plan to use the injured Borg as a weapon to wipe out the entire collective. 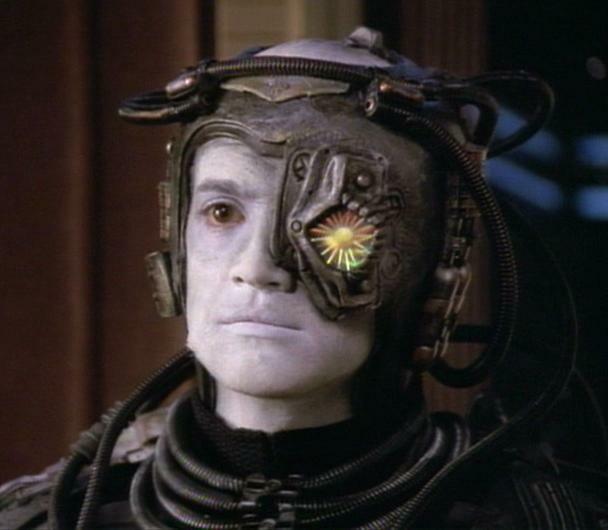 But the injured Borg, cut off from the hive mind, becomes an individual, and La Forge names him “Hugh”. After meeting Hugh, Picard eventually decides against using an individual as a weapon of mass destruction and decides against sending Hugh back with an invasive program. The crew sends Hugh back to the Borg — but with his new-found individuality. Hugh, upon returning to the Borg, destabilizes a subset of the collective with his individuality. The subset is later found by Lore — Data’s evil twin brother introduced in “Datalore” — who leads them on attacks against the Federation in the upcoming “Descent” two-parter, which begins in the sixth-season finale. That partly paves the way for Data to recover his emotion chip from Lore — which Lore stole from Data in “Brothers”. The emotion chip becomes a major focus point of “Star Trek: Generations” as we’ll discuss later. But this episode might be more important for what it says about 24th-century humanity (at least, the TNG version of it). In the first part of the episode, the only cast member speaking out against using Hugh as a weapon is Crusher. Even Troi and Data — characters who might object for various reasons — are pretty much behind the plan. But as the episode progresses, and as the characters get to know Hugh and see that he’s not a mindless killing machine, they realize that they can’t use him as such. It’s a core Trek message about morality, as it dismisses the caustic, security-first message we might have seen in later Trek (and in the beginning of this episode). It’s interesting to wonder what captains Kirk, Sisko, Janeway or Archer would have done in Picard’s situation. Given the actions by each of them — and given that Picard changes his mind despite the events of “The Best of Both Worlds” — I think Picard is the only captain (certainly, the only second-generation captain) who certainly would have not sent the invasive program along with Hugh. More on that in a moment. I’m glad this captain doesn’t want to get ‘that fish out of the ready room’. One real problem is the idea that the Borg couldn’t handle the infusion of individuality. The collective has assimilated billions, perhaps trillions of people. Didn’t they have individuality when they became drones? 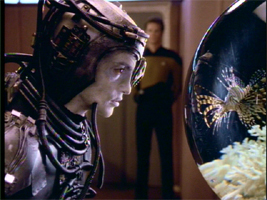 Or, is the idea that the Borg block the individuality of newly assimilated people but didn’t know to block Hugh’s? Lastly, I still don’t understand exactly where the Borg are in relation to the Federation. In “Q Who?”, we’re told they’re thousands of light years away, but that they most likely destroyed several Federation and Romulan outposts in “The Neutral Zone”, about a year earlier. Here, Hugh’s ship and the one that comes to recover it are in an area of space the Federation is considering for colonization — which means it can’t be too far away from more settled areas. But we don’t see the Borg (in their collective state) again for like four years — when they have a battle in the Terran system in “Star Trek: First Contact”. That’s despite the fact that they’re a relative stone’s throw (especially with Borg technology we see in Voyager) from the Federation and that they’ve been around the Neutral Zone, which was established when the Federation was newer and presumably much smaller. I suppose you could argue that the Borg are encountering other Federation ships and planets in events that didn’t involve the Enterprise (or, later, DS9). But that doesn’t seem to mesh with the foreboding surrounding the Borg return in “Descent” or in “Star Trek: First Contact”. Each time, the idea is that the Borg “HAVE RETURNED”. But what were they doing in the interim? Keep in mind that only a part of the collective is affected by Hugh after this episode. The big thing, I guess, is that the series could have turned into All Borg, All the Time, and that the creators didn’t want that. Sisko — who did some pretty dirty stuff in the latter years of DS9 and whose wife was killed by the Borg — would have likely sent Hugh back with the invasive program, with Bashir or possibly Dax questioning the decision. Janeway is tougher to pinpoint, as her character was more erratically written. But her near-obsession with getting her crew home would have likely prevailed — though it’s unlikely the Voyager creators would have forced her to make the hard choice, as that series was always about finding cheats for the hard questions. Same goes for Kirk really — though I think Kirk would have talked the talk more before finding a way to work around the problem. Archer, of course, was the one captain who was partly written after the events of 9/11. Given his actions during the third season Xindi arc — torture, piracy, etc. — I think he would have ultimately gone with the ends over the means. But he likely would have been torn up about it. 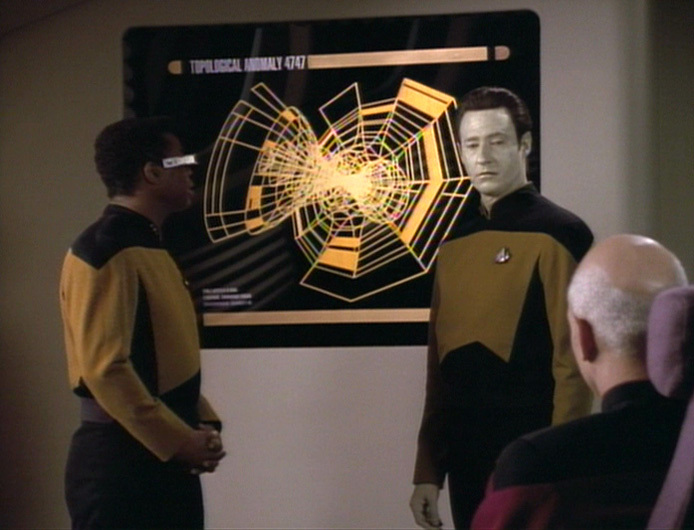 Anyway, this is a great TNG episode because it’s one that only really would have worked on TNG. It was Trek’s most idealistic crew and series and was the best about “doing the right thing” — at least, until the movies (more on THAT later). The episode also is well served by Patrick Stewart, who displays Picard’s anguish perfectly. The whole episode is about his high-sounding ideals fighting the awfulness he went through and the fear that the Borg could do it somewhere else. As Picard and TNG are wont to do, they pick the moral option. THERE … ARE … FOUR … LIGHTS! On the individuality question: I think the reason that Hugh’s return is a plausible threat to the Borg — although they’ve incorporated millions of individuals — is that Hugh developed his after assimilation. Perhaps it is the reversal of the assimilation process that is far more surprising, and dangerous. It kind of reminds me of Skynet, as Hugh becomes self-aware. And in 2015, I think the Borg are less scary as villains — we live with machines around us all the time and wonder how much they are co-opting us. But when the machines begin to think like humans, that’s when we get really scared.